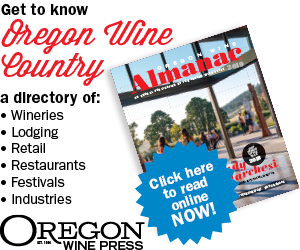 She certainly has the background to grab readers interested in wine and the wine industry. She grew up in McMinnville, then in the Dundee Hills with deep roots in the nascent Oregon vineyard and winemaking movement. Her father, James Brooks McDaniel, ran the McDaniel Grain & Feed business in McMinnville’s Granary District until an arsonist torched its third major fire; he sold it to Ralston-Purina. He’d been working with early wine pioneers such as David Lett for years already, and he carried on with his own vineyard, now the location of Torii Mor Winery. Boenisch played in the vineyard as a child. She learned from Lett, Jim Maresh, Vivian Webber and others who, for young Kerry, were simply family friends, rather than innovators, dreamers and artists of vine and wine. In the self-published 70-page book, she intersperses stories of her family and wine friends with tales of her near-death experiences — hints at first, then fuller descriptions of getting lost on a glacier, becoming submerged in rapids on the Deschutes River and, finally, almost drowning, again, on the Deschutes. After the latter, she was taken by helicopter to the hospital — another terrifying experience, since she’s afraid of heights. But even in the chopper, as she saw the beauty of the trees below, she realized she needed to embrace life, value every moment and be her true self, not the person she thought others wanted to see. 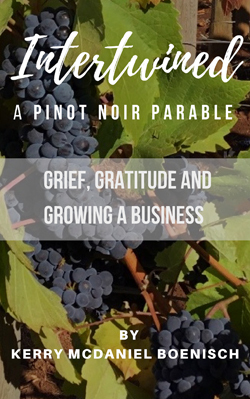 Writing in a stream-of-conscious style, Boenisch makes her point again and again, from different angles: Value day-to-day experiences and relationships; treasure every moment; approach whatever you do — running a business, growing grapes, judging wine competitions — with gusto. Live.